heavy bill is about 2 inches (5.1 centimeters) long. Adults are 9.0 to 9.5 inches (23 to 24 centimeters) long, and weigh about 1.1 ounces (31 grams). Geographic range: Coppery-chested jacamars are not seen very often because there are not very many of them. They have been seen at a few sites in Ecuador, southern Colombia, Amazonian Brazil, and along the eastern slopes of the Ecuadorian Andes at altitudes of up to 5,100 feet (1,550 meters), the highest elevations of all jacamars. Habitat: They are found in montane (mountain) tropical rainforests. Diet: Their diet consists of a wide variety of flying insects. They prefer to hunt from one favorite perch, watching carefully for possible prey. When seeing a possible target, they capture the flying insect as it flies through the air. Behavior and reproduction: Coppery-chested ja-camars are very alert hunters, as are all jacamars. They give a series of three to five loud calls such as "pee pee-pee-pe-pe-pee-pee-pee." Females lay one to four white eggs in curved ground-hole nests that are carefully hidden. When born, young are covered with white down. 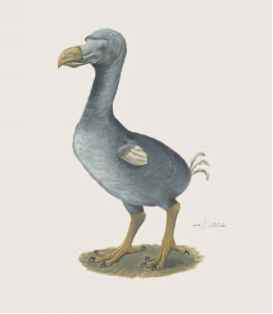 The incubation period is twenty to twenty-three days. Males and females share in incubation activities, along with taking care of the chicks as they grow. Coppery-chested jacamars and people: There is no known significance between people and coppery-chested jacamars. Steve Metz Photography. 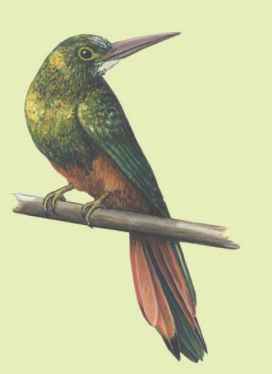 "Rufous-tailed Jacamar." http://www. stevemetzphotography.com/photo%20pages/Trinidad&Tobago/Rufous-tailed%2 0Jacamar.htm (accessed on July 19, 2004).